FirstLook is your go-to pre-flight tool for initial edits of submitted images. Point First Look at a folder of images, and you can view them in detail prior to choosing them for publication. FirstLook also gives you the opportunity to email detailed notes back to the image supplier. FirstLook is an integral part of Image Expert, allowing you to pre-test all uploaded images to insure that they meet your visual and content standards. Click on the button below to download Image Expert for Windows 30-day trial. Call us at +1 (203) 316-5500 for introductory pricing or contact us for more information. 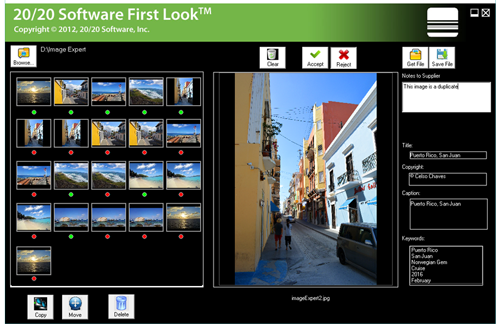 20/20 Software provides image maintenance work for client picture libraries. One client had a list of 14,000 images that they needed to find and extract from their storage system with 225,000 folders and 5,000,000 images. Any method of doing so manually would have been extremely onerous. Using 20/20's Image Expert, we were able to extract the 14,000 images in an unattended overnight process. We fed the list (a "control file") into the Image Expert, pointed it at the storage unit, and told it to find those images and copy them to an external USB. We also instructed the Image Expert to export the metadata for those 14,000 into a text file. The next morning, all 14,000 images were on the USB, along with a metadata file. A picture library was informed by one of their suppliers that the supplier had changed the name of the company and needed all the IPTC metadata updated in the picture library's image repository. 20/20's website and admin software can do this automatically on the fly, but the picture library also needed it done to the 25,000 archival TIFF's from that supplier, stored locally on a large storage unit. The library exported the supplier's metadata from 20/20's admin system [if you don't have 20/20's admin system, you would get the list of files from your own metadata system]; then they downloaded the resulting text file, and fed it into the Image Expert, asking it to update the metadata on the archival TIFF's. The Image Expert did this in less than 15 minutes. Picture libraries are now able to fully automate the ingestion of new images to their website. An agency with the full 20/20 system uses the Image Expert to analyze a folder of newly arrived images. All images that don't match the agency's criteria are moved to a separate folder, and a report is sent to the supplier. As soon as the analysis is done, the Image Expert converts the archival TIFF's to JPEG's and renames them according to the agency's internal naming convention. If you don't have the 20/20 Admin system, or a 20/20 Website, you can still use the Image Expert for the automation of analyzing, converting, and sending the images to your website.